Our comprehensive journey takes us along the iconic Gibb River Road, where we have ample opportunity to explore all the amazing gorges and sites. 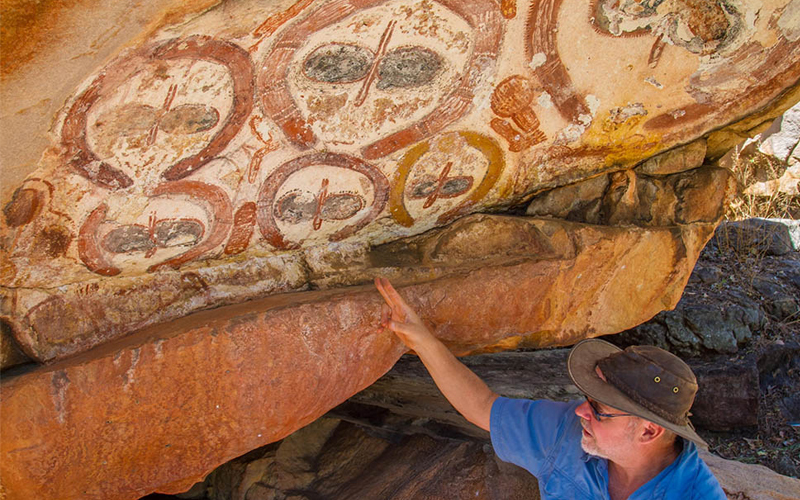 We then venture to the remote Northern Kimberley, the traditional home of the Aboriginal Wunumbal people where we view rock paintings believed to be over 30 000 years old. 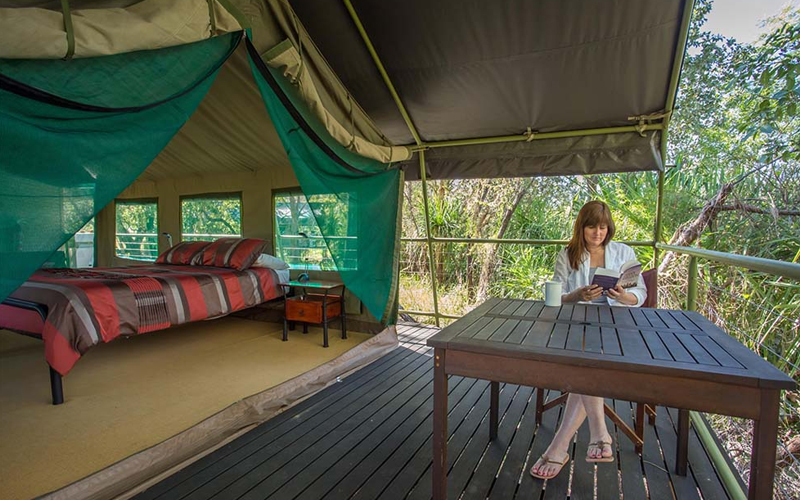 A highlight is our helicopter flight and trek out of the majestic Mitchell Falls where we enjoy two nights luxury accommodation amongst the palm trees. Our road trip concludes after exploring the World Heritage listed Bungle Bungles followed by a scenic flight to Kununurra. Departing Broome this morning we travel through the remote and beautiful landscape of the Western Kimberley, learning of local history, people and the environment. Our drive takes us to the remote township of Fitzroy Crossing where after lunch we join a cruise through the majestic Geikie Gorge. Nature carved this wonder between the Geikie and Oscar Ranges during the Devonian period over 350 million years ago and we’ll learn of the fascinating geology of this natural wonder and discover the huge array of wildlife including freshwater crocodiles, birds and fish. 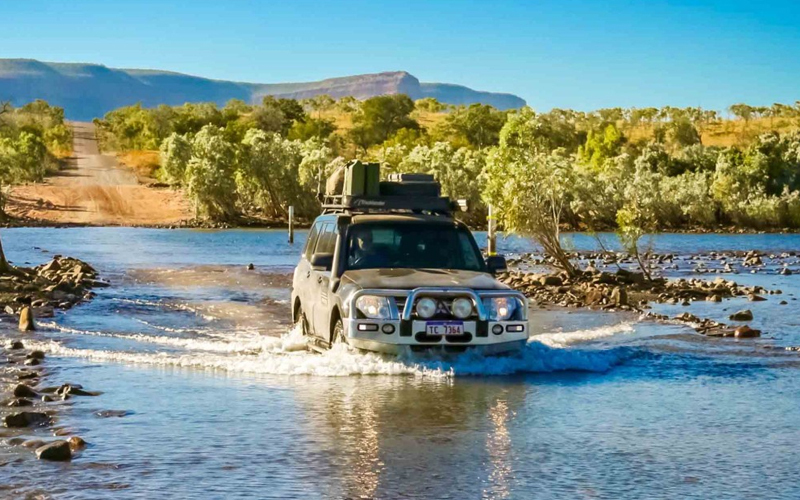 We visit the picturesque old Fitzroy River ford prior to checking into our comfortable accommodation for the evening. We join the Fairfield Leopold Road tracking through a stunning landscape of boab trees and limestone escarpments arriving at Tunnel Creek, a 750-metre cave system carved through the Napier Range, in which we discover stalactites, secret caves and a variety of wildlife whilst joined by a Local Indigenous Guide. It is here we also hear of the legend of Jandamarra, an Aboriginal freedom fighter who used the tunnel as a hide out in the late 1800’s. 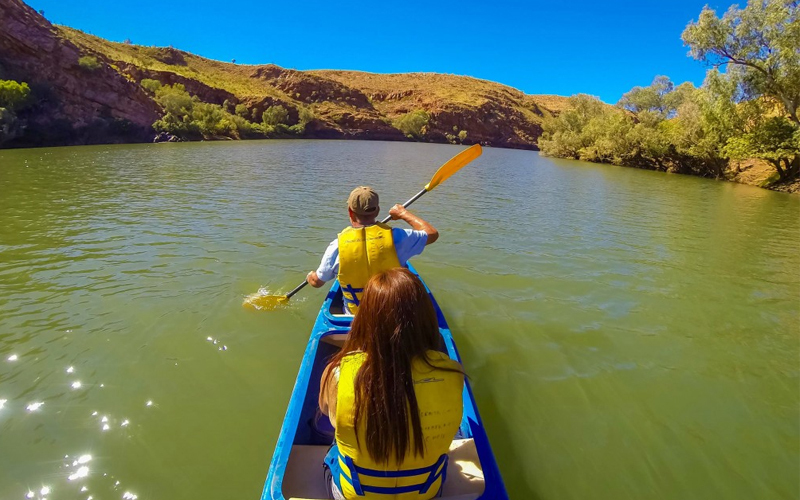 Our journey continues to the stunning natural beauty of Windjana Gorge with spectacular cliffs and an opportunity to get up close (but not too close!) with the endemic freshwater crocodile. After a picnic lunch inside the gorge we hit the Gibb River Road, the legendary track completed in the 1960’s to expedite the movement of cattle from remote pastoral leases. Today it’s been upgraded and maintained by main roads however still presents a challenge to the intrepid traveller and is closed by the numerous water crossings during much of the seasonal wet. Along the Gibb we traverse through the scenic King Leopold Ranges arriving at our comfortable wilderness accommodation. 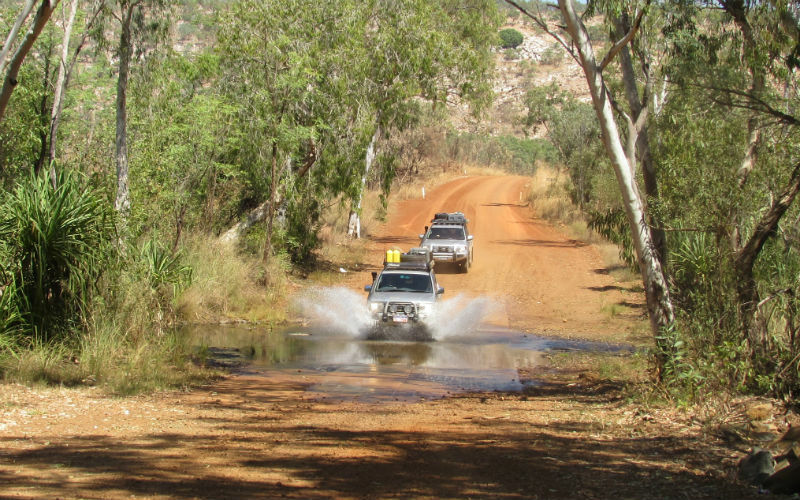 Our morning excursion sees visit Adcock Gorge prior to venturing back to the Gibb and driving towards beautiful Bell Gorge. A short walk takes us down to the stunning waterfall and swimming hole. We will have ample time to enjoy the scenery, explore the area, swim in the pristine fresh gorge waters and enjoy our picnic lunch. Late in the afternoon we return to our accommodation at the base of the Precipice Range. This morning we enjoy a swim at the stunning Barnett River prior to continuing our road trip through the Kimberley interior. Leaving the Gibb River Road we venture into the remote Northern Kimberley where a warm welcome awaits our arrival at the characteristic Drysdale River Station. Completely cut off from the outside world by road in the wet season the working cattle station has been owned and run by the Koeyer family for many years and ticks all the boxes for an out back setting. 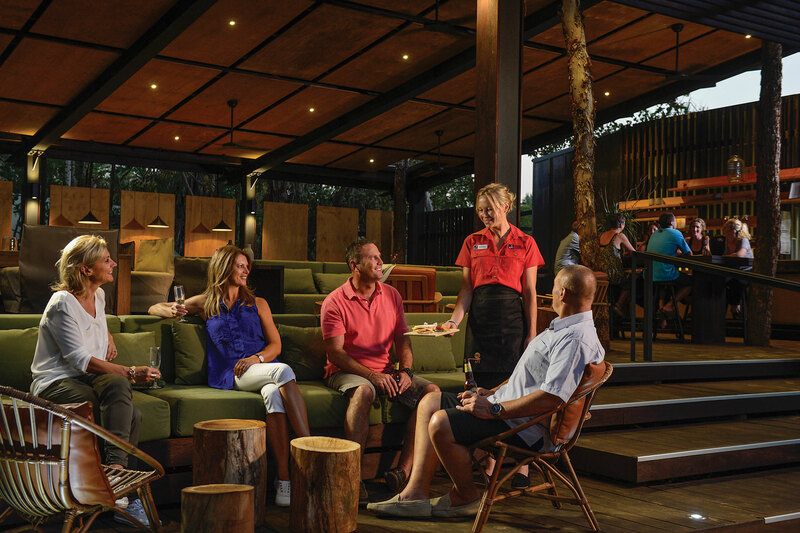 Don’t be surprised to hear a local strumming on a guitar singing one of your favourites around the fire as we settle into the outdoor bar for the evening – you may even like to join in. This morning we hit the rough & ready Pt Warrender Road as we head into the inspiring country of the Wununbal people – the traditional owners of the region north of the King Edward River. We will explore incredible rock art sites, have the opportunity to swim and be awed by the stunning beauty of the natural environment. After a picnic lunch on the banks of the pristine river, shaded by giant paperbarks we continue our journey through livistonia forests arriving at our spectacular wilderness accommodation, replete with it’s own swimming hole. Today you have a full day to discover the beauty of Mitchell Falls, with its magnificent waterfalls and Indigenous art. Begin with a guided hike to Little Mertens Falls to view rarely seen Aboriginal art. Continue on to Big Mertens Falls before arriving at Mitchell Falls. With superb scenery and rich culture, you can swim in the pools above the falls and spot the region’s abundant wildlife. We have also included a helicopter flight over Mitchell Falls and the surrounding wilderness back to the vehicle (Hike & flight may operate in reverse order). Longer helicopter flights over this captivating and remote coastline are available at additional expense. Then, it’s time to meander back to our wilderness lodge to relax around the fire, knowing you have just experienced a day most people can only dream of. 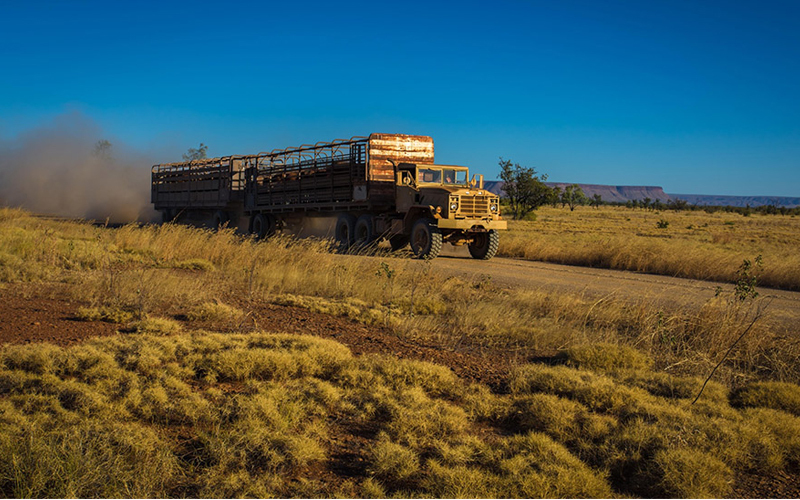 Retracing our way along the Kalumbaru Road we once again join the Gibb, where we enter Durack country, cattle pioneers of this tough country. Travelling East we get an appreciation of the harsh, but inspiring, country that these early cattle men and their families set through in the hope of improving their lives. Many came and went, some perished, however others were the backbone of opening up Northern Australia and their legacy lives on. A surprise awaits as we call into an outback oasis for a ‘devonshire tea’ break. This afternoon we arrive at Home Valley Station where the modern out back facilities are eagerly appreciated. 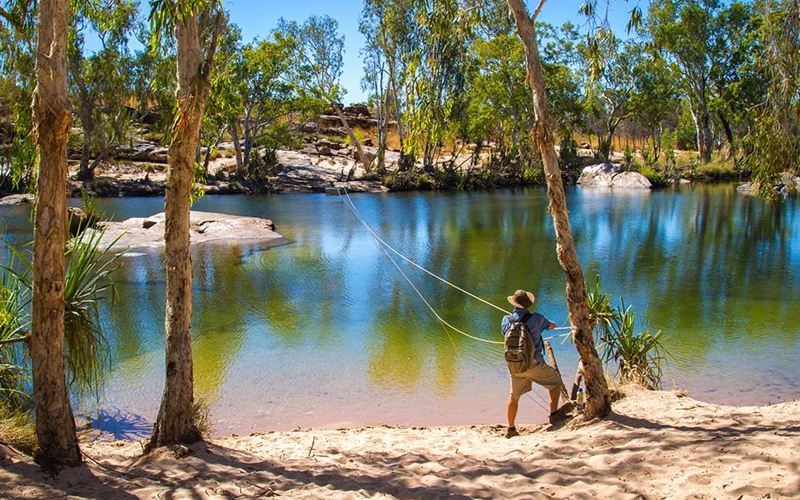 Our adventure continues today as we cross the mighty Pentecoste River and journey through the iconic El Questro Wilderness Park, where you may recognise the landscape from the Baz Luhmann movie ‘Australia’. 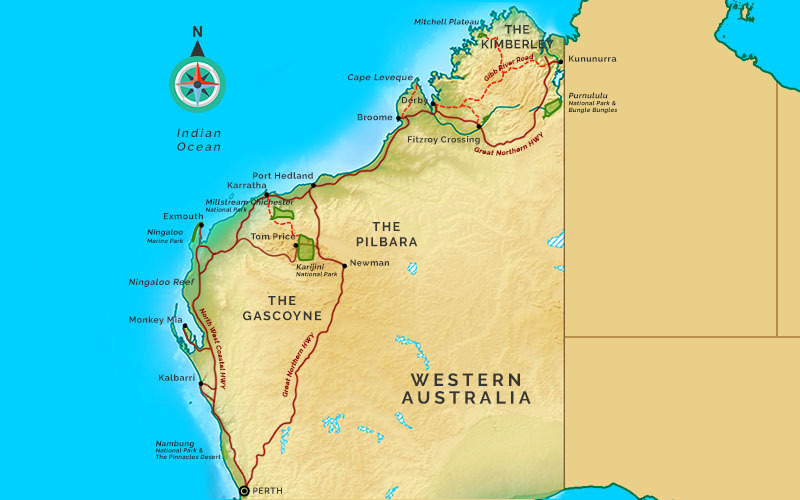 The most famous station and tourism resort along the Gibb River Road will not disappoint. The spectacular landscape, dotted with boab trees and spectacular gorges is the perfect environment to appreciate the captivating beauty of this remote region. We have ample time to traverse the gorges and enjoy a refreshing dip in the warm spring waters of Zebedee Springs prior to arriving at stunning Emma Gorge Resort, your home for the evening. The afternoon is the perfect time to tackle the challenging Emma Gorge walk prior to enjoying a cocktail and a delicious meal under the evening sky.. Departing El Questro and the Gibb River Road, this morning we journey deep into what is sure to be a highlight of our journey, the World Heritage protected Purnululu National Park, a spectacular wilderness region that is home to some of the country’s most striking geological formations. 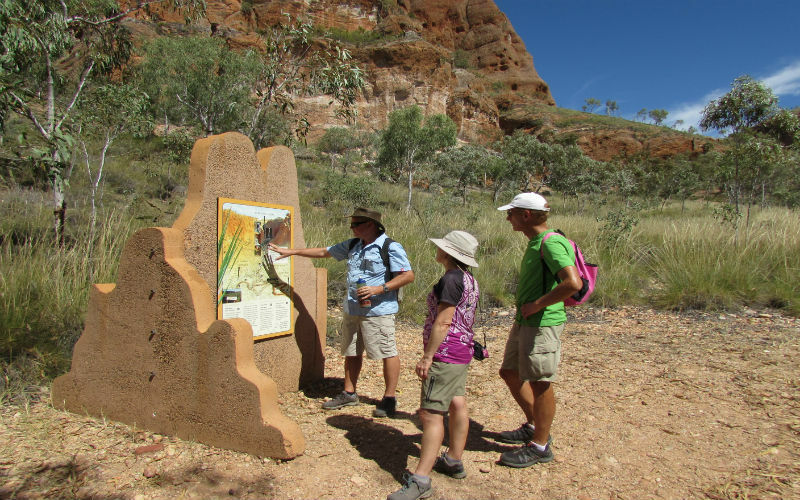 Travel the Spring Creek Track and discover the magnitude of Purnululu as we hike to Echidna Chasm, a spectacular natural cleft in the rock. 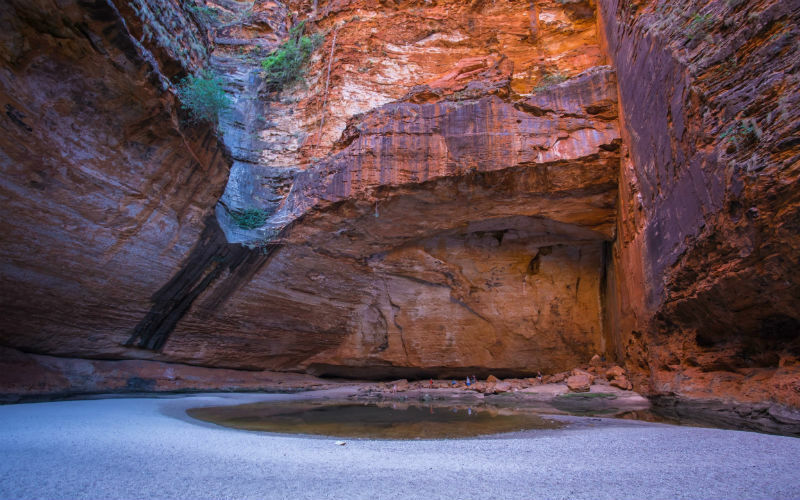 Narrow in width, with walls reaching 100-metres high, the chasm is a must see in the Kimberley as the afternoon light sees it at it’s most glorious. This evening we arrive at the private Bungle Bungles Lodge, our home for the next 2 nights. 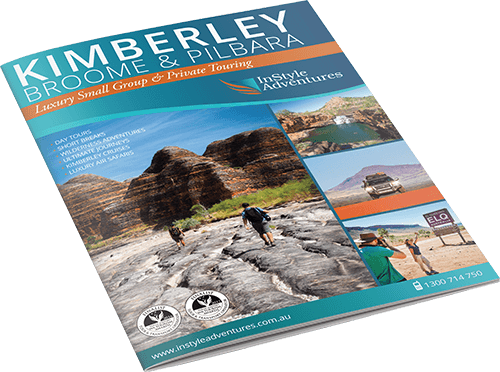 We have a full day to continue our exploration of this extraordinary natural wonder, including the famous Bungle Bungle domes. Rivers created this landscape of unique orange and black striped ‘beehive’ geological formations over a period of 20 million years. Unbelievably, only the locals knew it existed until the early 1980’s; once discovered by others, the area was made a national park in 1987. 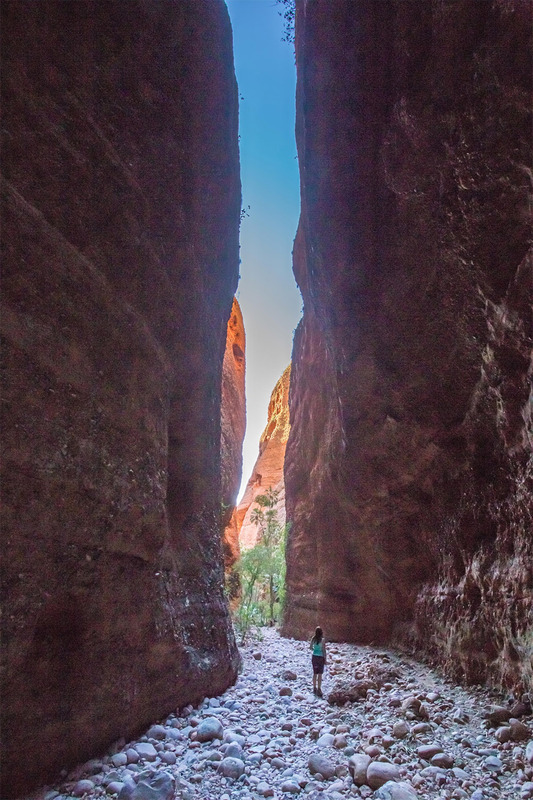 We take a short walk into stunning Cathedral Gorge, where towering rocks create a natural amphitheatre and will have time in the afternoon to take a highly recommended optional helicopter flight that puts the whole area into a spectacular perspective. (Approximate cost $399pp – own expense). This evening view another glorious sunset once again enjoying drinks & nibbles. 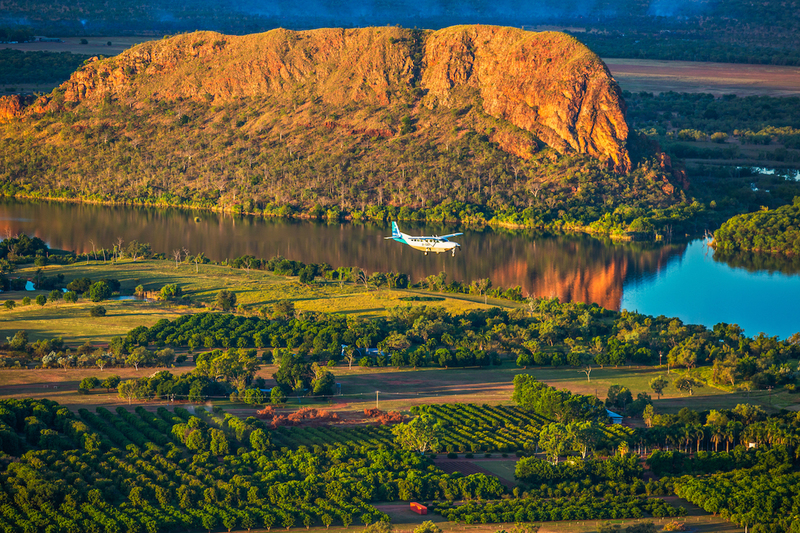 After a breakfast a scenic flight transfer to Kununurra including a spectacular view of the Argyle Diamond Mine on your last morning is included in the package. 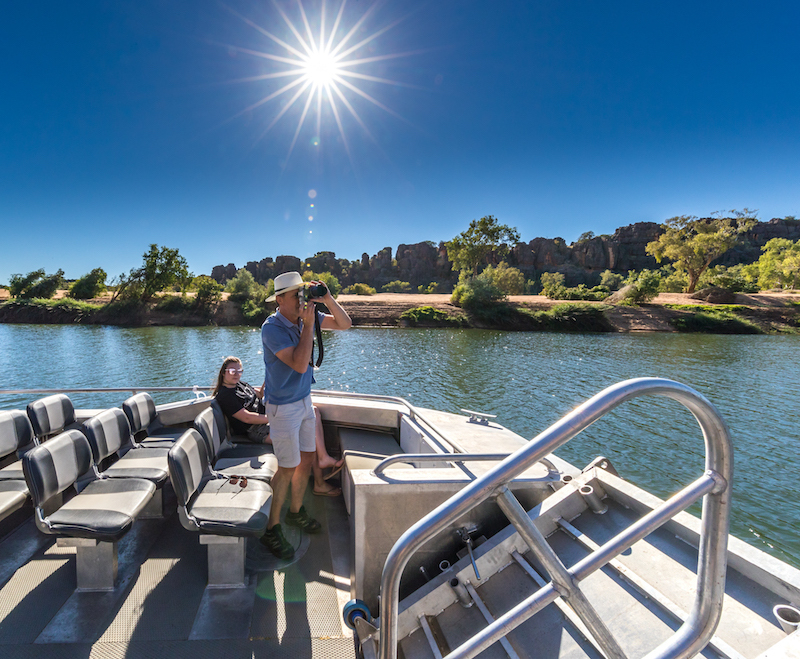 Your tour concludes with a drop off to Kununurra airport or town. Regular onward flight connections to Broome, Perth & Darwin are available from Kununurra. Note that luggage weight & size restrictions may occur on this transfer flight – we are able to assist in forwarding excess baggage if necessary. Some itineraries involve some clambering over rocks, through water & walking on un-even ground. A reasonable level of fitness is advised however options can be arranged to suit most guests abilities. All tours operated by 3rd parties are subject to that operator’s terms & conditions and availability. The Kimberley climate during our touring season coincides with ‘the Dry’. Generally the temperature ranges between 28-32º C during the day & may drop down to below 6º C during the night. It may be considerably warmer during September & October as ‘the Wet’ approaches.